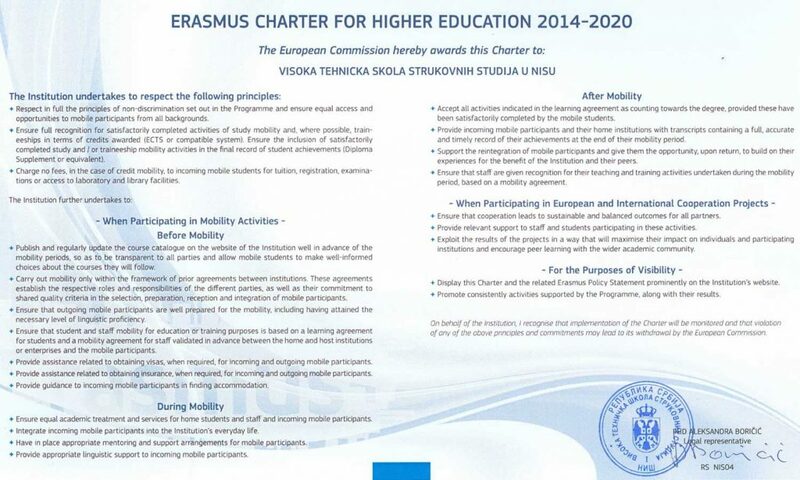 COLLEGE OF APPLIED TECHNICAL SCIENCES IN NIS has been awarded an Erasmus Charter for Higher Education – ECHE within the call of the Education, Audiovisual and Culture Executive Agency- EACEA for 2019, by which our institution is placed among other European higher education institutions which completely fulfill the standards of a unique European area in higher education. Erasmus Charter for Higher Education is a document based on which the European Commission awards accreditation to higher education institutions from program countries thanks to which they can compete for Erasmus + program projects and take part in them. It contains the basic principles that higher education institutions have to comply with in order to be able to take part in the Program. Also, Erasmus charter offers the basic quality framework for European and international cooperation.